father of Otago’s albatross colony and for his research on the behaviour of the hoiho. Richdale, a teacher, spent his weekends, holidays and evenings undertaking major and meticulous research on penguins, albatrosses and several petrel species. Friday the eleventh day of the eleventh month in 2011 was a memorable day for a small group of people visiting Dunedin. 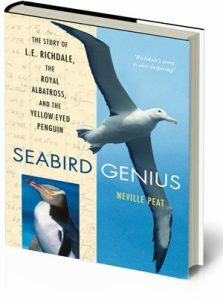 Members of both Lance and Agnes Richdale’s family were hosted by the Yellow-eyed Penguin Trust on an Otago Peninsula tour as a precursor to the launch of Seabird Genius. The extended family of 15 nieces, nephews and cousins were shown some of the Trust’s work on a private reserve, the site where Lance undertook his first penguin studies at Cape Saunders. They were then given a tour of the Albatross Centre at Taiaroa Head by the Otago Peninsula Trust. You can order your own copy of this fantastic book through the Otago University Press.